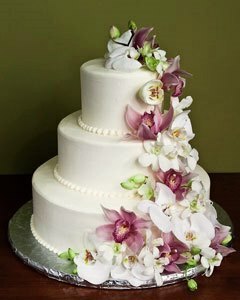 Tips on Ordering Three-Tiered Wedding Cake - There are so many choices of 3 tier wedding cakes that can make bride-to-be feel overwhelmed. A wedding will not be perfect without a wedding cake. Some brides love to have a tall and grand wedding cake. Some others love to have simpler and smaller ones. A three-tiered wedding cake is the best option for those who have a smaller wedding. 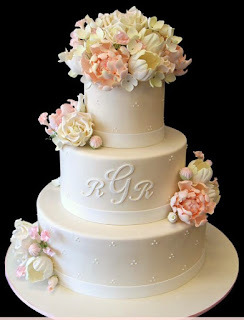 Even though, they are not as grand as five-tiered wedding cakes but they can be as gorgeous as those tall wedding cakes. Three-tiered wedding cakes are available in various design styles and decoration. One of the most popular wedding cake ideas is flower idea. Many brides love 3 tier wedding cakes with flowers because they are beautiful and attractive. 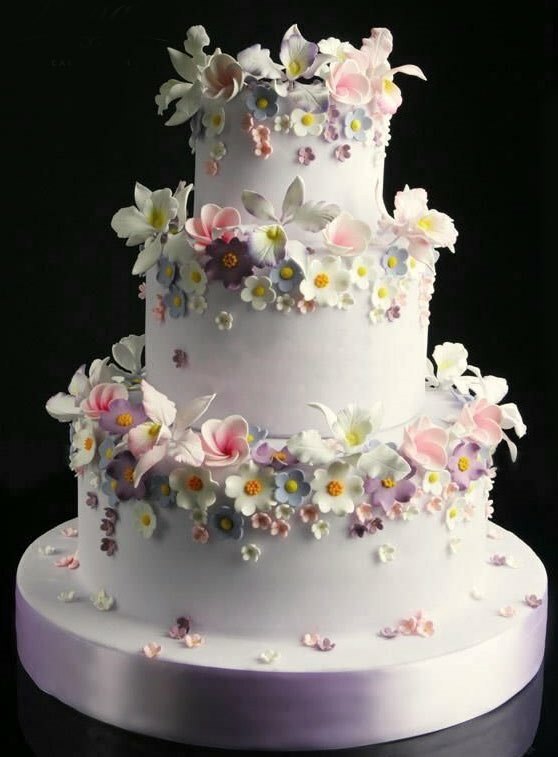 This particular cake is a great way to match your wedding flower bouquet. If you have a red rose wedding bouquet, you can request a three-tiered wedding cake which is adorned with red rose sugar-flowers or fresh flowers. You can also match it with the flower of your centerpiece. Fabric-inspired wedding cake is another wedding cake idea that you can have. This particular cake looks elegant and luxurious. It has beautiful pattern and usually has monotone color. However, you can also have it in two combinations of colors. Other three-tiered wedding cake ideas that you can choose are bejeweled wedding cake, candy wedding cakes, traditional wedding cakes, and modern wedding cakes. 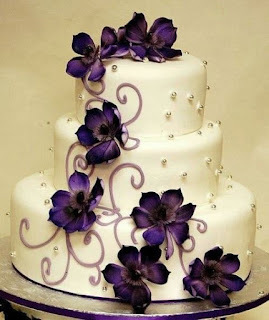 When you are shopping for a wedding cake, you must not only consider its decoration and style. There are several things you must think about before ordering a three-tiered wedding cake. You must order one from a reputable bakery. Once you found two or three reputable bakeries, you must start comparing the cake quality and cost. One of the things that you must consider is the taste of the wedding cake. It is very important for you to try the sample of the wedding cake before you order it. That’s why you must come to the bakery when tasting is scheduled. If you want to have different taste on each tier, you must make sure that you sample the taste of all the three of them. You must also consider the frosting of your wedding cake. You can choose buttercream, meringue, whipped cream, or fondant. Fondant will make your cake looks smooth and almost surreal. A wedding cake with this frosting looks beautiful and attractive. However, fondant is not as delicious as buttercream. If you have an outdoor wedding in the summer, you had better have fondant-covered cake. 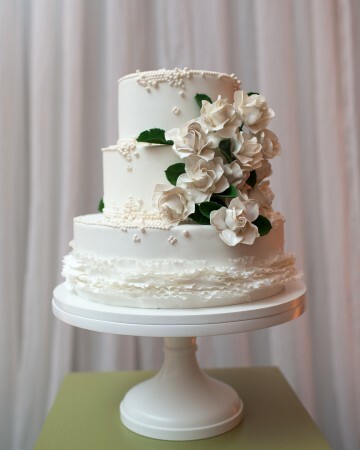 To get your ordered wedding cake delivered on time, you must order it weeks before the wedding. Some experts recommend you to order it three months before your wedding day. That’s because this cake is special and the bakers may need time to get certain ingredients or cake decoration. When you order the wedding cake, you must not forget the number of your wedding guest. A 3 tier wedding cake will serve between 50 and 100 hundred guests. The following is some three-tiered wedding cakes that have various design styles and decoration to inspire when you want order a wedding cake. 2 Responses to "Tips on Ordering Three-Tiered Wedding Cake"
Wow! The wedding cake is really looking stunning. Pearl designs on cake are giving it exotic looks. I have seen similar type of wedding cake in a royal wedding at one of iconic local wedding venues. Even other cuisine look delicious.